I was born in Thessaloniki, in the north of Greece, but went to England at the age of 17. At that time I was vacillating between studying art or architecture, but in the end I studied economics with mathematics at Sussex University – perhaps because I couldn’t decide between the first two! On graduating, I intended to continue with post graduate studies in Econometrics, but had to take a year off because my daughter was born. That year was crucial, because I started painting again. I reconsidered the direction my life was taking, then applied to study painting. A few years after graduating in fine art, I did an MA in theater design with the help of a scholarship from the British Council. I suppose turning to theater design was a way of going back to my interest in architecture, since both fields have to do with creating spaces. I did my first theatre design in London in 1993. This was a fascinating and frightening experience, because the play – The Investgation by Peter Weiss – dealt with the 1963-4 Frankfurt war crimes trial and Auschwitz concentration camp. I had many sleepless nights because I felt the burden of responsibility not only to the production, but also to the history of the victims of the concentration camps. In fact some concentration camp survivors came to talk to the participants in the production, something that was enormously valuable. Working on this play right at the start of my career taught me the vital importance of simplicity and of avoiding anything unnecessary or merely decorative; my ‘appropriately sparse design’ was even mentioned in The Independent newspaper! I’ve dwelt on this play because of its significance to me and because it somehow connects with another difficult design project I undertook later, that of designing for a theatrical reading, in Patmos, of the Revelation according to St. John, in 1995. This was the reason I went to the island of Patmos, where the exiled John has his vision, for the first time. Although in many ways a very different type of project from The Investigation – set on a huge rock with elaborate ‘mythic’ costumes – for me it was a similar challenge of doing justice to a disturbing and ‘gruesome’ text. Through theater I learned to deal with such difficult texts and, as a result, I think I grew as a person. Through designing for theater I also learned a huge number of techniques and crafts, gaining practical knowledge of materials, developing focus and discipline, learning to work within often severe limitations and to accept responsibility to others in the group, which I would never have mastered or even understood via painting. 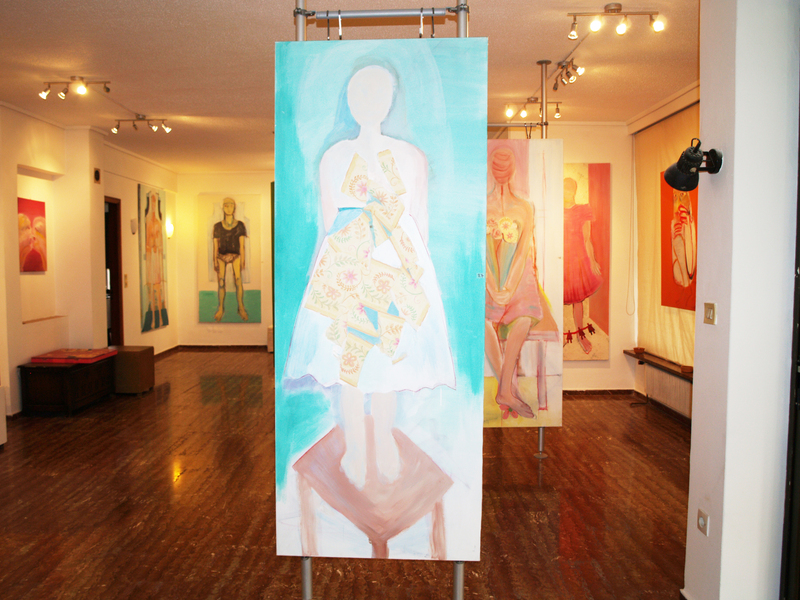 In fact, I have not a single painter friend, because I find it difficult to communicate with fellow painters. The majority of my friends are architects and designers. 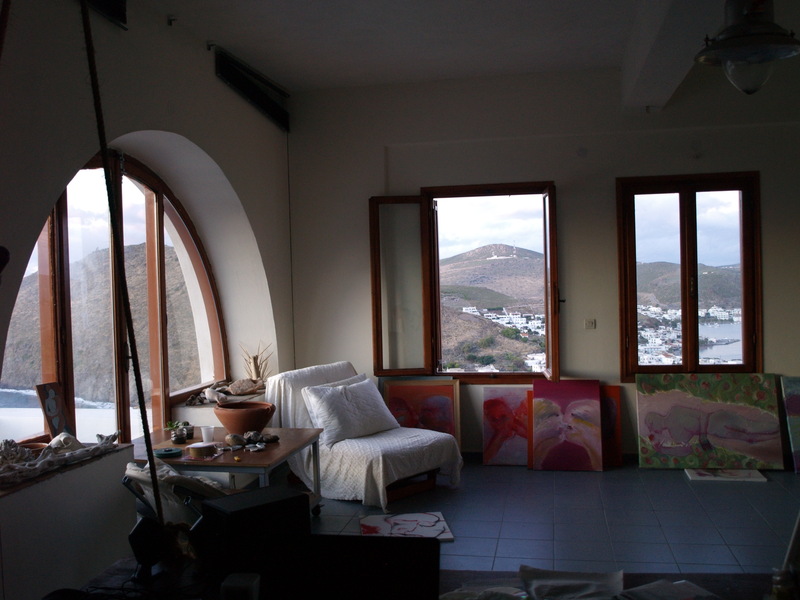 From the year 2000 I also had the opportunity myself to design and supervise the building of my studio–house in Patmos, which gave me great satisfaction despite the difficulties of building in a remote Greek island: being a stranger, having no experience in this area, and being a woman. This could have been a one-off thing, but it isn’t: I’m going on now – undeterred – with plans for an art centre next to my studio. At the moment the only obstacle is the usual one, money, but, as I’ve learned from so many theater productions, one has to do with the limited means available and things happen if only there is the desire. I have designed sets and costumes for 24 plays and dance productions in England and Greece, including plays by Beckett, Weiss, Pinter, Bond, Lorca, Sophocles and Euripides, and also have participated in devising theatrical performances in collaboration with Growtowski-trained actors. I have exhibited paintings and installations in 10 one-person shows in England and Greece. I have also done numerous other kinds of artistic or art-related work, inluding book illustration, cartoons and drawings for television, digital photography and interior design, as well as teaching painting and theater design. I think my most interesting ‘fine art’ work relates to theater and to sculpture. I am talking about my sculptural costumes depicting theatrical roles, which I conceive as big masks for the whole body. Go to the Theater Design page to see some of these. Here is a costume-sculpture inspired by my theater work.